In the 17th and early 18th centuries, a family of Lynns lived in Londonderry, Donegal, and Tyrone which included brothers William, Charles, Audley, and possibly John and sisters Elizabeth and Margaret. William was born about 1690 and chose medicine for his career. The names these siblings gave their children suggest that their own parents were named William and Ann, although this author has no record to confirm it. Another author suggests instead that their parents were William Lynn and Margaret Patton, but the source on which that author relies is an 1879 letter written by the wife of a descendant of Dr. Lynn's sister Margaret. Regardless, the record as a whole ~ especially, Dr. Lynn's will and Londonderry corporate records ~ should lead one to believe that the City and County of Londonderry must have been the home of the immediate family of Dr. Lynn in Ireland. 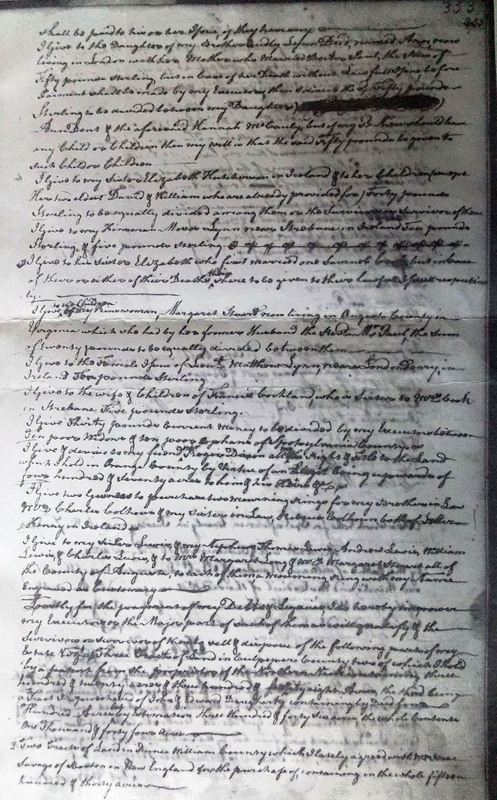 Notably, an apothecary named William Lin petitioned the Londonderry Common Council for admission as a freeman of the city on 2 January 1715/16 [Corporation of L.Derry Minute Book from 1704 to 1720, p. 256]. Apothecaries in that day had earned the status of skilled practitioners and often served as physicians. At the same time, it wasn't until the 19th century that the medical professions as a whole were fully established in their modern institutional forms. Considering the inconsistency in spelling of names through the 18th century, it is very possible, though not proven, that the apothecary William Lin and Dr. William Lynn were one and the same. Also, Dr. Lynn left family in Londonderry, and elsewhere in Ulster, as recorded in his 1757 will. The brother named first in the will is Charles, and a Mr. Charles Linn was admitted a freeman of Londonderry just eight years after William Lin's admission [Corporation of L.Derry Minute Book, vol. 4, p. 51]. Regrettably, Charles's record does not mention his trade or profession, as does William's. Leaving a large number of relatives in northwest Ulster, Dr. Lynn crossed the Atlantic sometime in or before 1727 and settled in what would become Fredericksburg, Virginia. In 1727, Dr. Lynn ~ along with Robert Brooke, Jr., Robert Lewis, James Mills, William Lewis, and Beverly Robinson ~ petitioned the Governor and Council of Virginia for "Fifty Thousand Acres ... on the head branches of the James River to the West and Northwestard of the Cow Pasture ... lying among the great North Mountains, being about Two Hundred Miles at least from any landing ..." They also asked to be allowed six years to seat the land with "one Family for every Thousand Acres". [Calendar of Virginia State Papers, Vol. I : p. 214]. 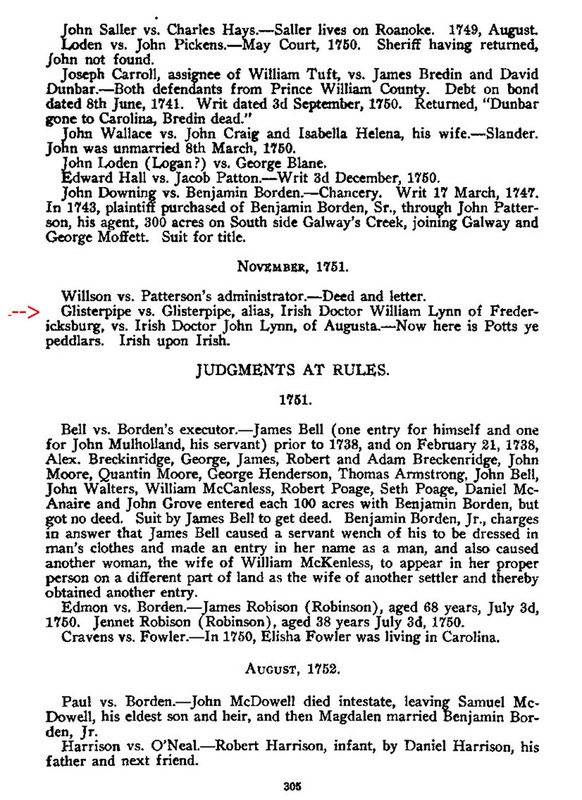 In November 1751, as the plaintiff in an Augusta County lawsuit, Dr. Lynn was described as the "Irish Doctor William Lynn of Fredericksburg". The defendant was "Irish Doctor John Lynn, of Augusta [County, Virginia]", who is believed to be a brother not named in Dr. William Lynn's will. In the following year, it was noted in a lawsuit captioned Wright vs. Linn that Dr. John Linn had left Augusta County. 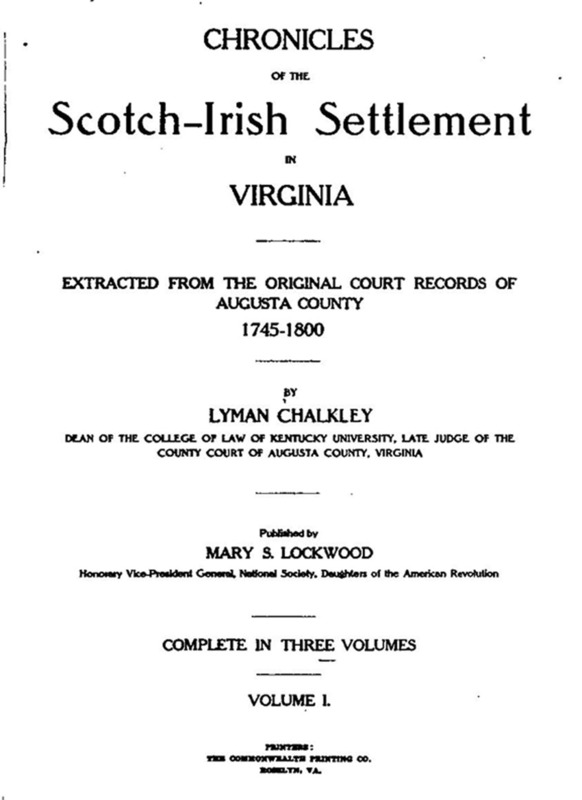 [Chronicles of the Scotch-Irish Settlement in Virginia, Vol. I, pp. 305, 307, Lyman Chalkley, Rosslyn, VA (1912)]. What is important to note is that Dr. William Lynn was not the only person to take Dr. John Lynn to court. In 1757, the year before Dr. Lynn's death, Major William Lynn was listed as one of the Field Officers of the Spotsvylvania County Militia. [Calendar of Virginia State Papers, Vol. I : pp. 252-53]. Since Dr. William Lynn had no sons, he and Major William Lynn likely are one and the same. Dr. Lynn wrote his will this year. In his 1757 will, Dr. Lynn described himself as a doctor of physic, which in that era meant a doctor of medicine, while the field of physics was part of what then was called "natural philosophy", referring to the study of the natural world. As listed in his will, Dr. Lynn owned considerable lands and houses not only in Spotsylvania County but also in Culpeper, Orange, and Prince William Counties. His Orange County land was bequeathed to his friend Roger Dixon. His Fredericksburg property and certain of his Culpeper County properties were bequeathed to either his daughter Ann, his reputed daughter Hannah, or Hannah's daughter Mary a/k/a Molly. Dr. Lynn's remaining properties were to be sold by his executors to pay his debts and legacies. It may be no coincidence that one Roger Dixon appears in the Londonderry minute book just 25 days after William Lin, apothecary [Corporation of L.Derry, Ibid., p. 357]. Several men named Dent, which would become the married name of Dr. Lynn's daughter Ann, also appear in the minute book as contemporaries of William. Dr. William Lynn executed his will on 21 October 1757. On 16 February 1758, he added, dated, and signed the appointment of an additional executor. 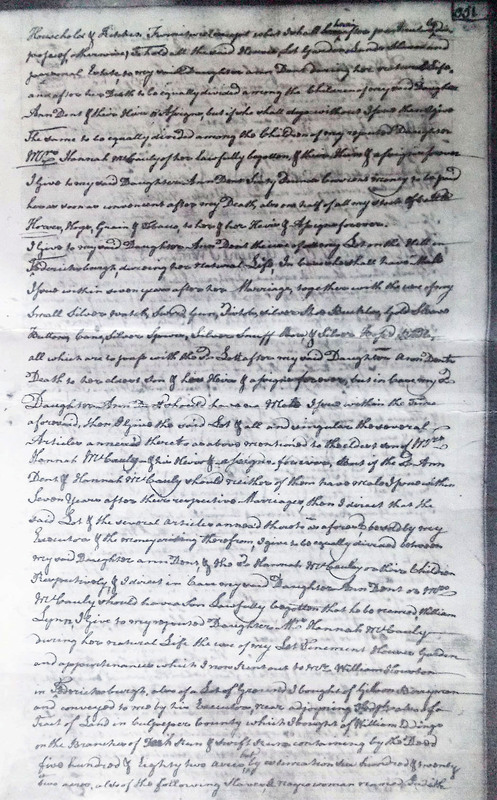 The will was probated less than a month later, on 7 March 1758, so that Dr. Lynn must have died between 16 February and 7 March 1758. [Spotsylvania County Will Book B, 1749-1759 : pp. 350-54]. Note: With spelling, punctuation, etc. not yet standardized, the original of this will contains many words that are capitalized mid-sentence which today would not be. In these transcripts, only proper nouns and first words in sentences are capitalized. Also, for ease in comparing each transcript against its respective original page, each line of the text ends exactly as in the original, including placement of the end of each line. "my reputed Daughter, Mrs. Hannah McCauly"
"Mary McCauley, daughter of the aforementioned Hannah McCauley"
"the Daughter of my Brother Audley Lynn, Dec'd, named Ann, now living in London with her Mother who married Doctor Paul"
"my sister Elizabeth Hutcherson in Ireland and ... her children ... Her two oldest David & William"
"my kinsman Moses Lynn near Strabane in Ireland ... [and] his sister Elizabeth, who first married Samuel Cook"
"the children of my kinswoman Margaret Stuart now living in Augusta County, in Virginia which she had by her former husband, the Rev. Mr. Paul"
"the female issue of Lieut. Matthew Lynn, near Londonderry, in Ireland"
"my Brother in Law Mr. Charles Colhoun & my sister in Law, Rebecca Colhoun, both of Letter Kenny in Ireland"
"my sister [blank] Lewis & my Nephews Thomas Lewis, Andrew Lewis, William Lewis & Charles Lewis ... all of Augusta Co. [Virginia]"
Hannah was conceived by Dr. Lynn's wife while still married. He had good reason, such as known infidelity, to question Hannah's paternity but could not legally deny paternity since he and her mother were married. His wife persisted in allowing him to be the presumed father, leaving Hannah with no other father from whom to expect any support or inheritance. William made generous bequests to Hannah because he felt legally bound to do so and because he considered that she had nothing to do with the circumstances of her own conception. Indeed, the will contains a conspicious further distinction between the two women, Ann Dent and Hannah McCauley. Thirteen times in the will, Dr. Lynn called Ann Dent either "my daughter Ann Dent" or "my said daughter Ann Dent"; once he referred to her simply as "the said Ann Dent". However, he never referred to her merely as Mrs. Ann Dent even though Dent was her married name. In contrast, Hannah was referred to only twice in the will as "my reputed daughter", but three times as "Mrs. Hannah McCauly" and five times merely as "Hannah McCauly" or "the said Hannah McCauly". In each of the six instances where he named both women together, he never once referred to Hannah as a daughter, reputed or otherwise. In five of those same instances, he did call Ann Dent "my daughter" or "my said daughter"; e.g., "my daughter Ann Dent & Mrs. Hannah McCauly". In his will, Dr. Lynn stipulated that "in case my said Daughter Ann Dent or Mrs. McCauly should have a son Lawfully begotten that he be named William Lynn". As with the descriptor "my reputed daughter", this stipulation should not be taken as proving a blood relationship between Dr. Lynn and Hannah McCauly. In the culture from which Dr. Lynn had come, it was quite common for a man of property with no sons to stipulate that a grandson born of a daughter carry on his name to go along with any property the child might eventually inherit. In this case, leaving property to even a "reputed daughter" would, to the mind of someone such as Dr. Lynn, prompt the same provision for passing on his name along with his property. Having both a brother-in-law and a sister-in-law with the surname Colhoun means of course that Colhoun was the family of Dr. Lynn's wife. If, instead, he'd had a sister who married into the Colhoun family, he would have had only a Colhoun brother-in-law. Indeed, if Charles Colhoun and Rebecca Colhoun were husband and wife, there would be no need to describe them as "both of Letter Kenny". Dr. Lynn leaving a share of his estate to his in-laws speaks to his having a good relationship with them. 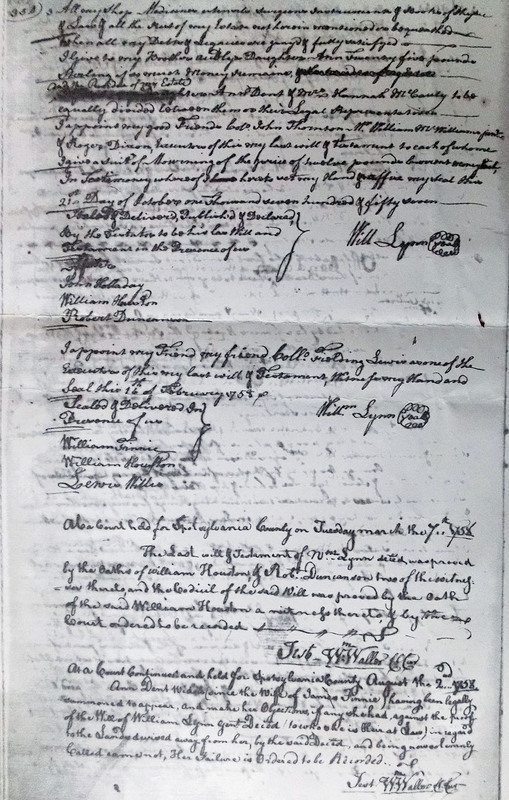 While the probate copy of Dr. Lynn's will lists his sister Margaret simply as "Lewis" with no first name, it may be that the clerk who wrote the probate copy of the will could not read her first name in the original will; and, in any case, there is ample proof that she was in fact Margaret Lynn, wife of John Lewis. 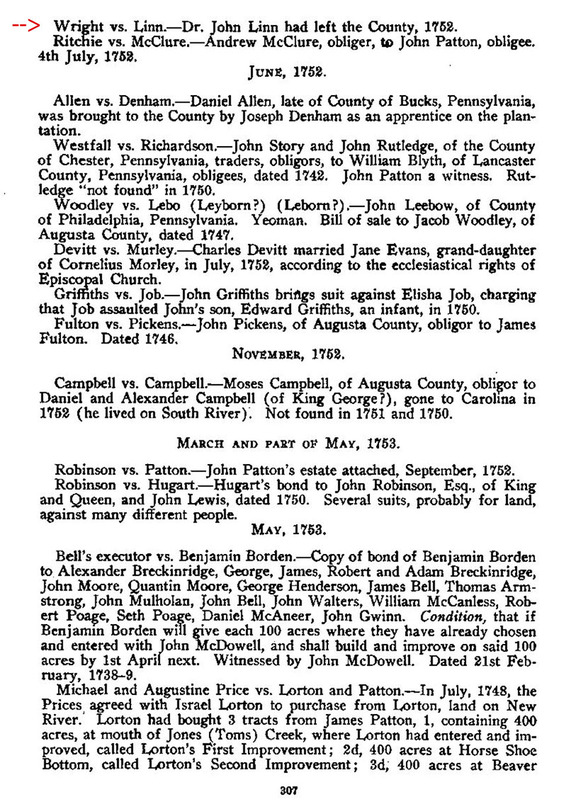 First, Dr. Lynn's will named four of the five known sons of Margaret and John Lewis and placed the family in Augusta County, where Margaret and John were the founding couple of Staunton, Virginia. Margaret and John Lewis are reported to have immigrated to the Staunton area from County Donegal, Ireland; and various biographies of two of their sons who were prominent early Americans ~ Brigadier General Andrew Lewis and his brother Thomas Lewis ~ report that both men were born in County Donegal. Particularly notable is the fact that another son of John and Margaret (Lynn) Lewis was named William Lynn Lewis. 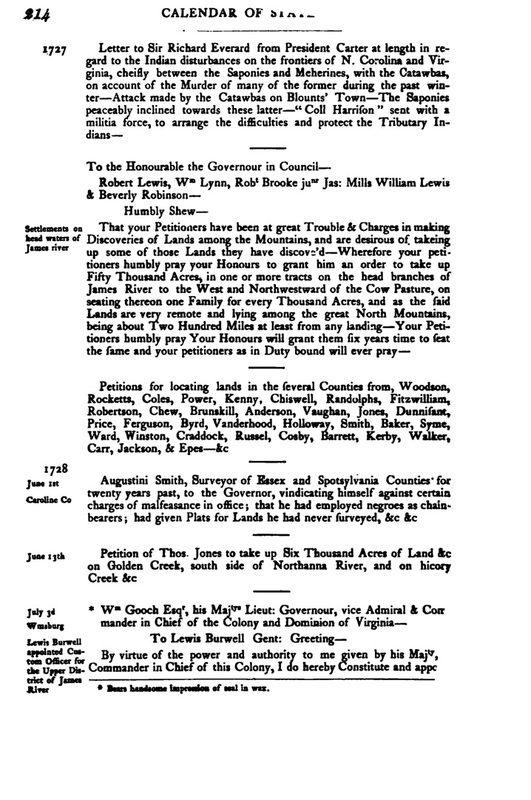 "The next evidence known to exist ... is contained in the petition of Robert Lewis, William Lynn, Robert Brooke, Jr., James Mills, William Lewis and Beverly Robinson, bearing the date in the year 1727, and addressed to the Governor and Council, praying for 50,000 acres of land on the Cow Pasture and James rivers, 'lying among the Great North Mountains' ... William Lynn, named in this petition, was a brother-in-law of John Lewis, the pioneer settler of Augusta county, who probably went to that locality upon information derived from his relative. He was a physician, resided in Fredericksburg, Va., and his will was recorded in Spotsylvania county March 7, 1758." 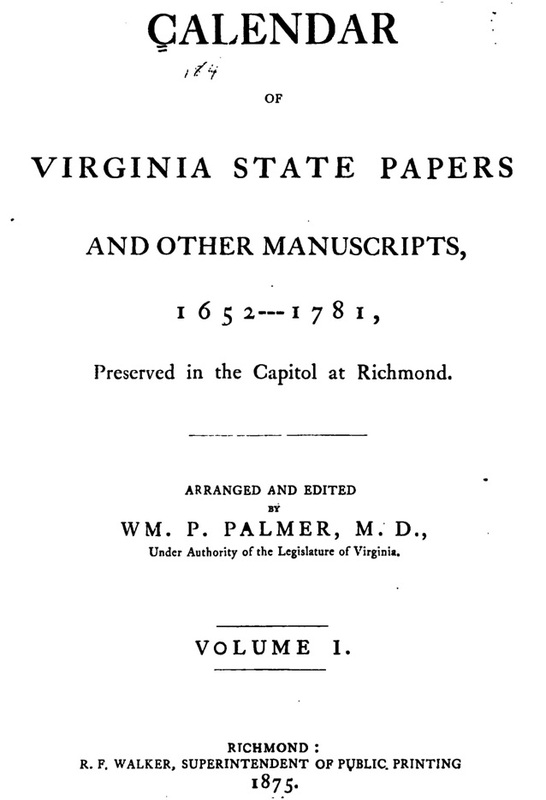 The Magazine cites "Calendar of Virginia State Papers", Vol. I, p. 214, and "Spotsylvania County Records", New York (1905), pp. 16-17. An interesting bequest in the will of Dr. William Lynn was to Ann and Hannah of Dr. Lynn's "Books of History & Divinity". 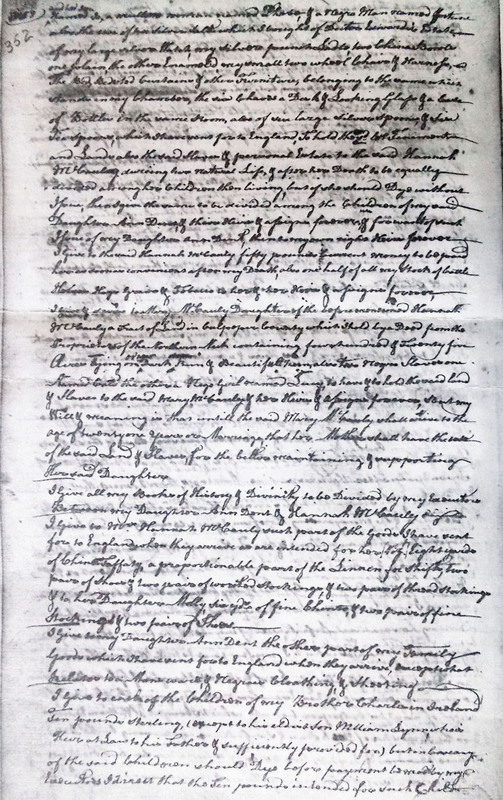 Dr. Lynn wrote in the opening paragraph of his will: "... committing my soul to God with hopes of a remission of my sins at the general resurrection thr'o my saviour & Redeemer Jesus Christ ..." Other bequests included "Thirty pounds current money to be divided by my Executors between Ten poor Widows & ten poor orphans of Spotsylvania County", following the biblical mandate in James 1:27 to "look after orphans and widows ..." It is obvious that Dr. Lynn was a devout Christian, though he was no more perfect than any other man. "2 Two Tracts of Land in Prince William County which I lately agreed with [?] Savage of Boston in New England for the purchase of containing in the whole fifteen hundred & thirty acres." 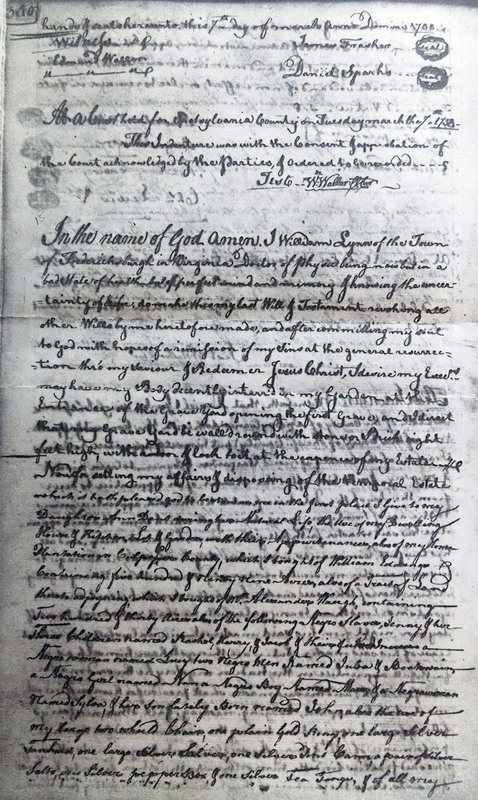 Extracting Dr. Lynn's will and probate records, along with biographies of his nephews Thomas Lewis and Andrew Lewis, renders the following brief genealogy of an Ulster family with a forbear whose forename likely was also William. Each and every sibling included in Dr. Lynn's will for whom a son or sons were also listed named a son William. In one case, the will specifically notes Dr. Lynn's brother Charles as having named his eldest son William. Unknowable is the precise relationship of each of Dr. Lynn's other kin named in the will: Margaret Stuart of Augusta County, Virginia; Moses Lynn, near Strabane, Ireland; Moses' sister Elizabeth; and Lieut. Matthew Lynn, near Londonderry, Ireland. However, the record as a whole ~ Dr. Lynn's will, the Londonderry records, etc. ~ should lead one to believe that the City and County of Londonderry must have been the home of this Lynn family in Ireland. For extensive collections of the history of Lynns, Linns, Linds, etc. in Scotland and Ulster, see Book Excerpts on CDs.